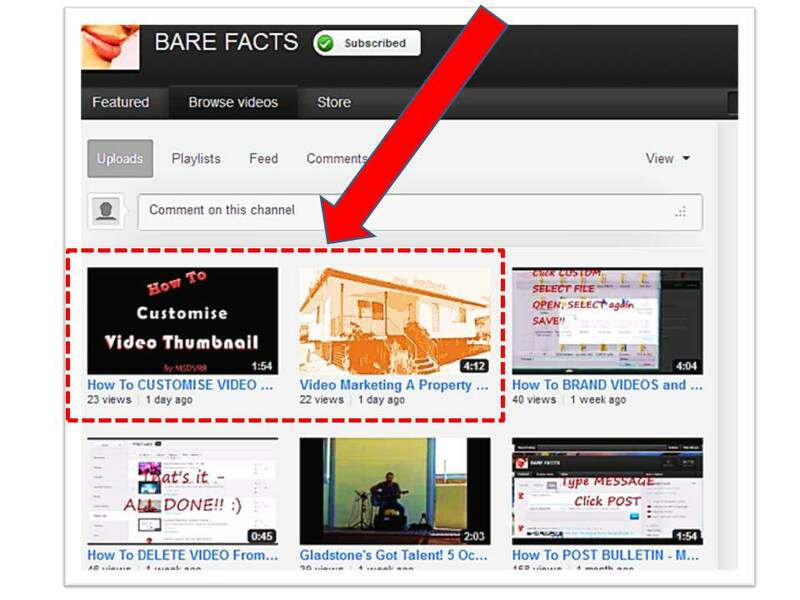 The ability to customise a thumbnail for your video is a relatively new feature on Youtube. Previously you had 3 choices (the image at the beginning, middle or end of your video - these were already selected for you and were not necessarily ideal choices but you could not change or deviate from what was offered ... until now). The above video tutorial shows you how to customise video thumbnails so I will not retrace the steps here but will discuss other aspects not dealt with in the above tutorial. The difference between those videos with and those without customised thumbnails is more prominent when you see them together, side-by-side as on your 'BROWSE VIDEO' screen. 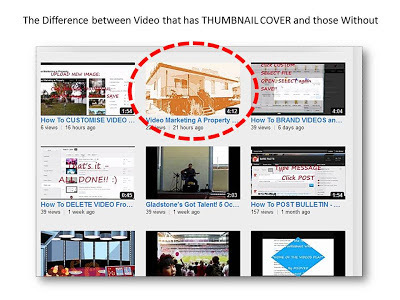 In my screenshot below notice the distinct difference between those videos without customised thumbnails and those that have them (the ones ringed by the red, dotted line - follow the RED ARROW in the diagram below). The latter thumbnails look more professional and more attractive plus you have that added BONUS where you can use that thumbnail to INITIALLY CAPTURE the interest of your potential audience by having an eye-catching IMAGE and a gripping TITLE (you only have a mere 5 seconds to do so) before most people click away and browse elsewhere! Audience attention is, unfortunately, notoriously short online and increasingly getting shorter (too much choice, distractions - social media, games, etc.) unless your content is outstanding. Notice how that 'thumbnail' looks really good FULL-SIZE (see above video) and how much better compared to the original one (see PIC 2, Top LHS) before we created our own thumbnail (black, red & white theme)? TIP: Take some effort with your thumbnail especially if you are showcasing a high quality video or if TRAFFIC is important to you. You can also change the thumbnail later to suit your circumstances so using customised thumbnails allow for flexibility and better promotional benefits and opportunities that will pay DIVIDENDS later on down the track, and for an indefinite period as videos tend to have a longer shelf life ... often much longer than most blog posts! TIP: Place your videos into a PLAYLIST (choose a magnetic title) then embed the URL to that playlist in your blog as well - that way you get to promote the ENTIRE playlist, with the result that.you end up getting more BANG (views) for your video-bucks! And it's also great for SEO. TIP: Allow embedding of your videos - everytime someone embeds your video, it gets a free backlink and more traffic (more views). What about you? Have you started customising your thumbnails yet? Observed any changes to your traffic / engagement yet?